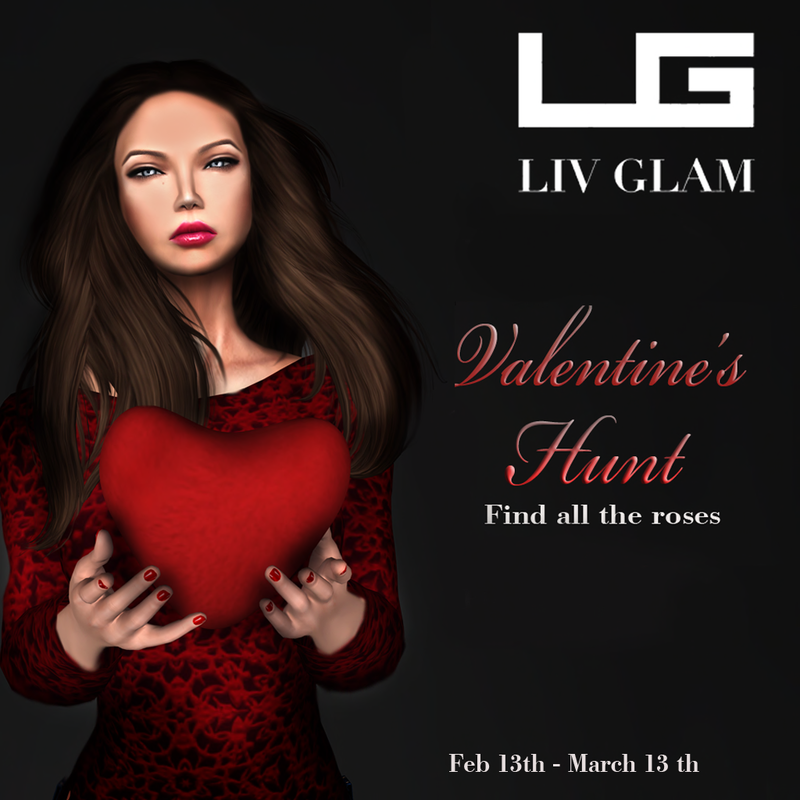 A deluge of new releases hit Liv-Glam with all the glam and beauty that’s true to the highest standards that Liv-Glam has set. 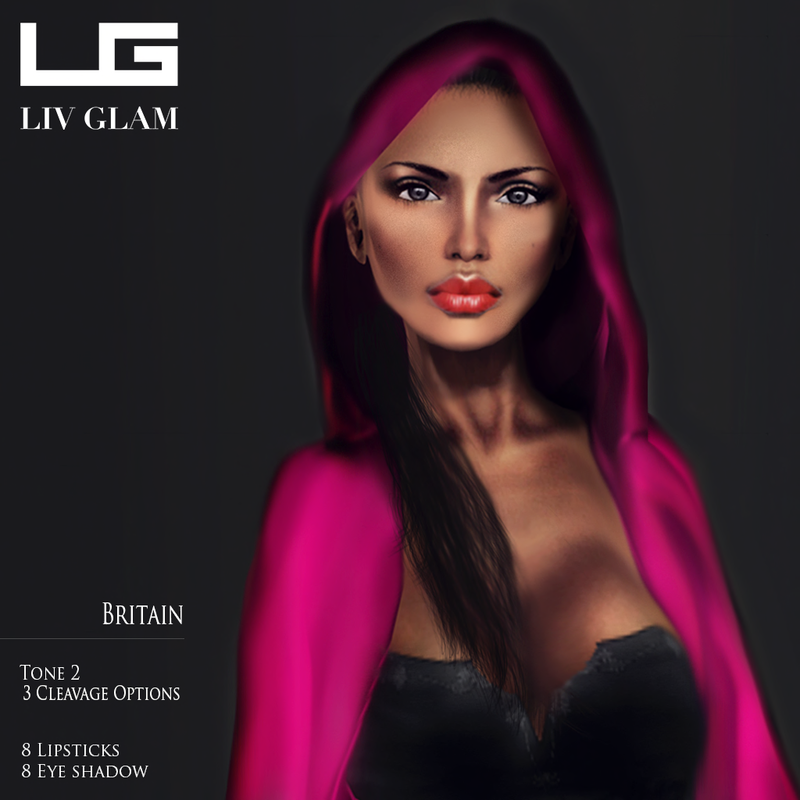 There are items from Liv-Glam and Liv-Glam’s K Collection, a new make-up HUD, shoes and a handbag from Stella. 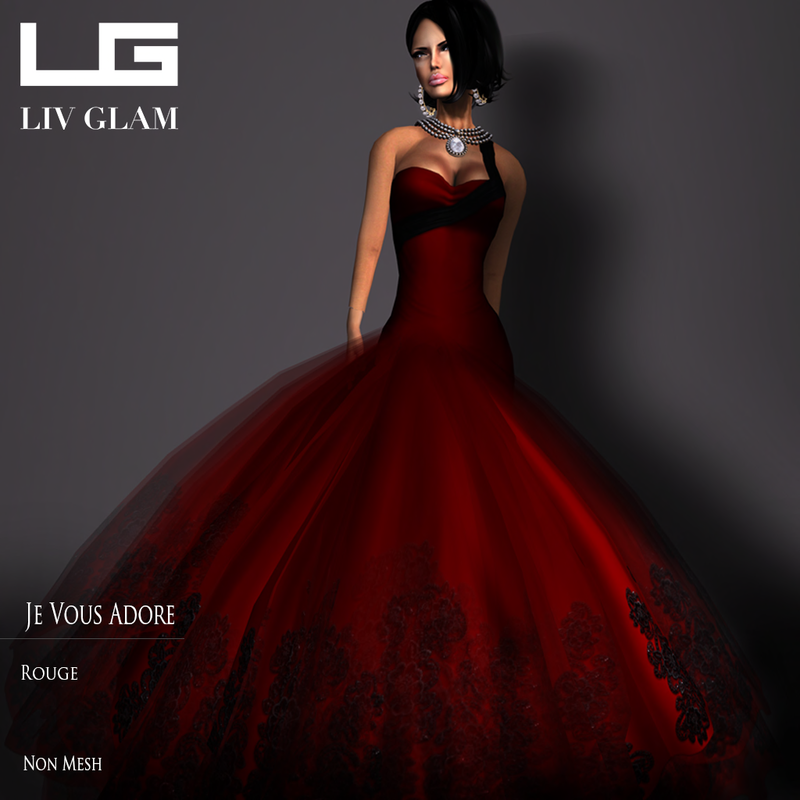 This first dress, Waiting 4You, comes from the K Collection. You can wear this mini in cool weather as the sleeves are longer. You’ll notice that though this dress is monochromatic it’s print looks stunning. The vivid paisley teal jumps off the black background on this Naomi Jumpsuit. All You Need? This shirt makes me think of the rest of the sentence. All you need is… ME! This jeans and three-quarter length top is all you need for a casual day, a picnic, a walk through Second Life’s oldest botanical gardens. It’s the last K Collection piece on sale for Monday/Tuesday sales. 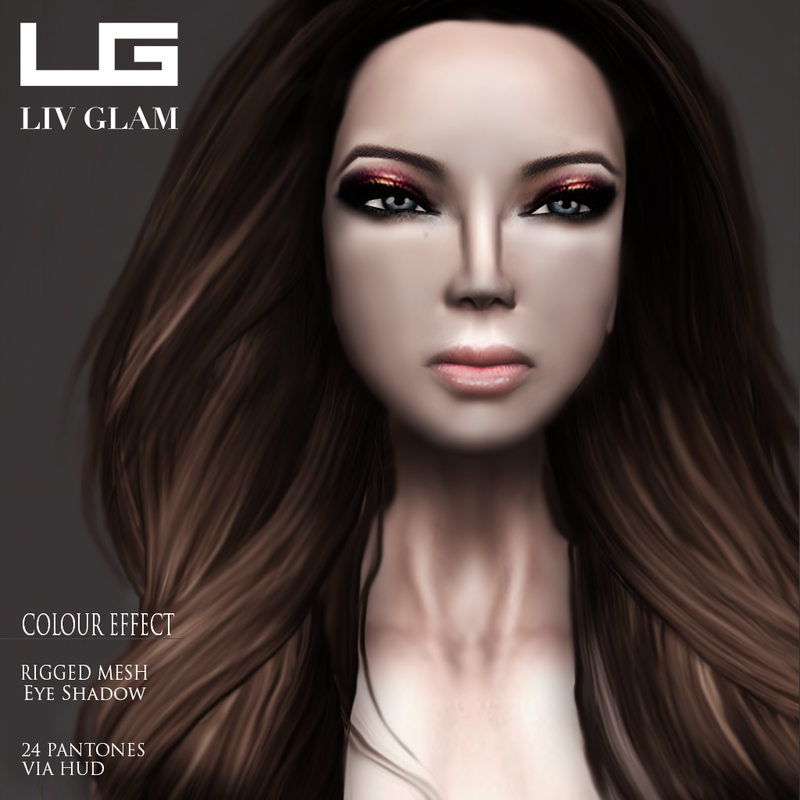 Have you seen the eye shadow yet? This 24 pantones HUD gives you the perfect color no matter what you’re wearing. Try it. You’ll love it! Ambrosius reminds me of a classic southern dessert treat. Mmm. And this dress definitely has that delicious look that stirs other senses with a resounding mmmm so good. Ambrosius II (the extra I is left out of the photo) has a similar design in shape but the textile painting this version also stirs the senses. Quoting Shakespeare from Romeo and Juliet, “A Rose by any other name would smell as sweet.” Oh so sweet. I love it when the new bags come out at Liv-Glam because I know the designers do their home work to the nth degree, studying fashion around the world to be certain they bring you the most fashionable trends. The Xiulan Shoes offer several different places you can add and change colors. 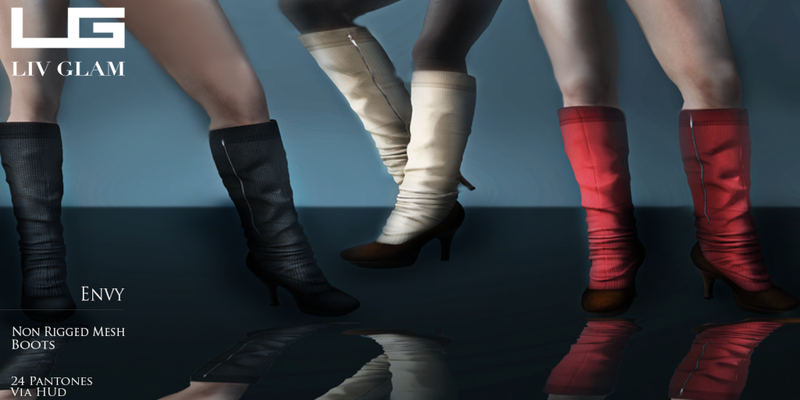 I think they have one of the most interesting looks for shoes in all of Second Life. Two versions of the Herve dress offers different color and pizazz. Both will make you wan to go party or create your own party at home. One of the Herve works with warm colors and the other, seen above, offers the black and white with shades of grey trend that’s becoming very popular.